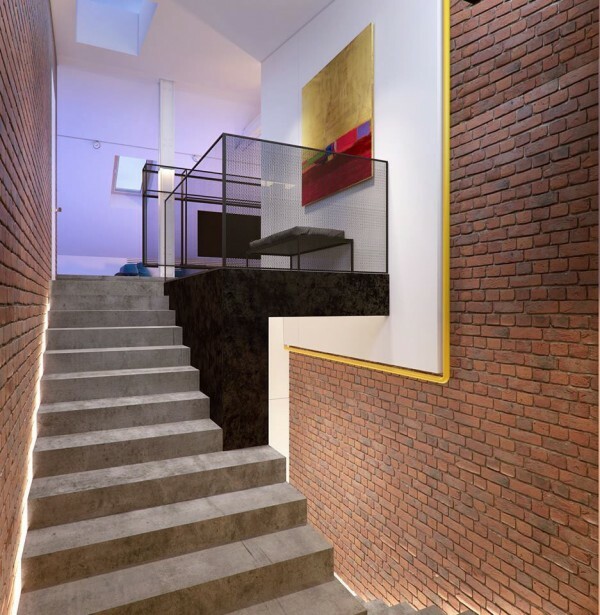 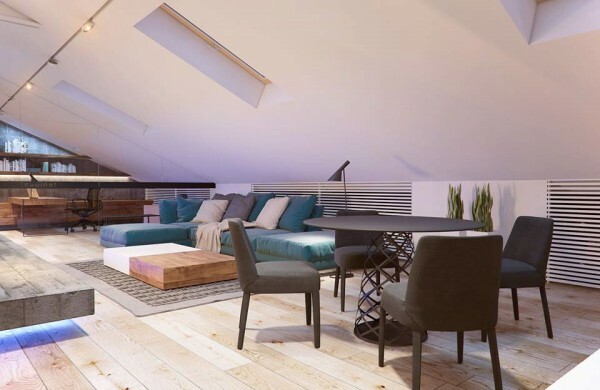 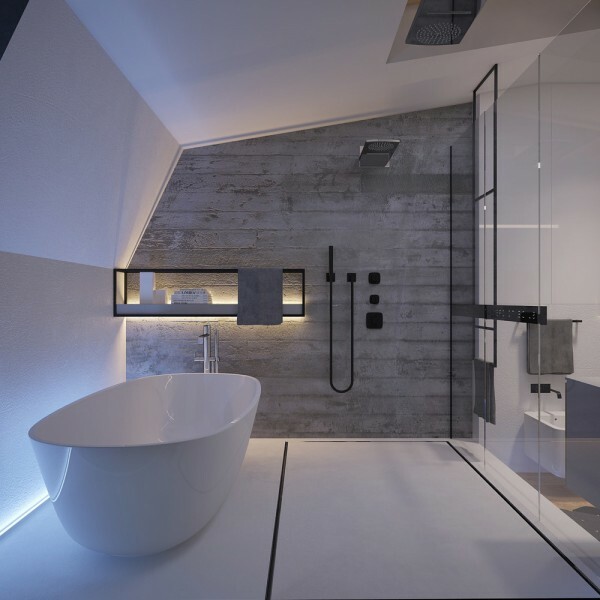 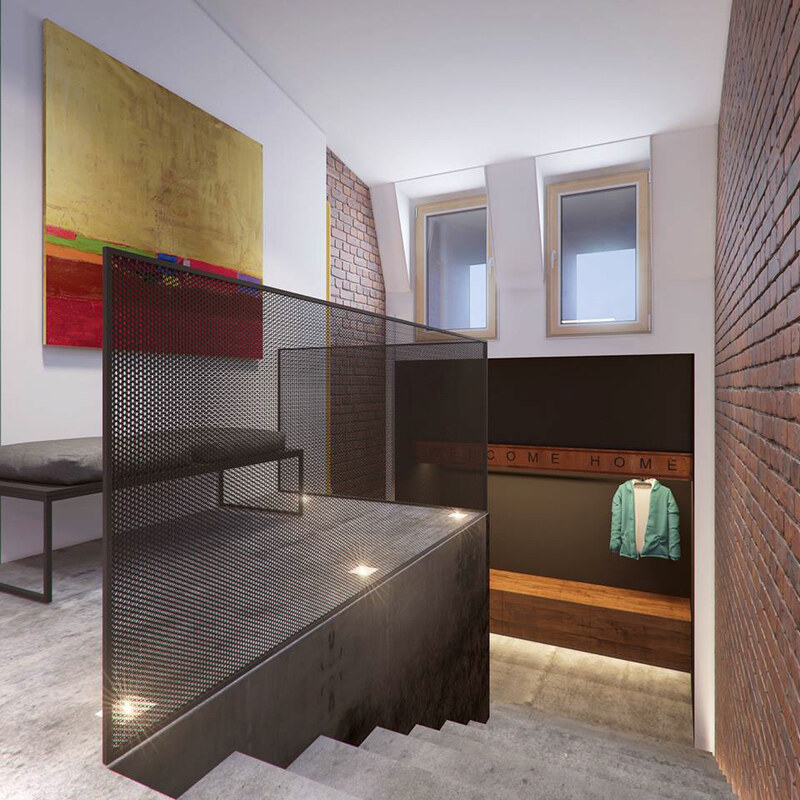 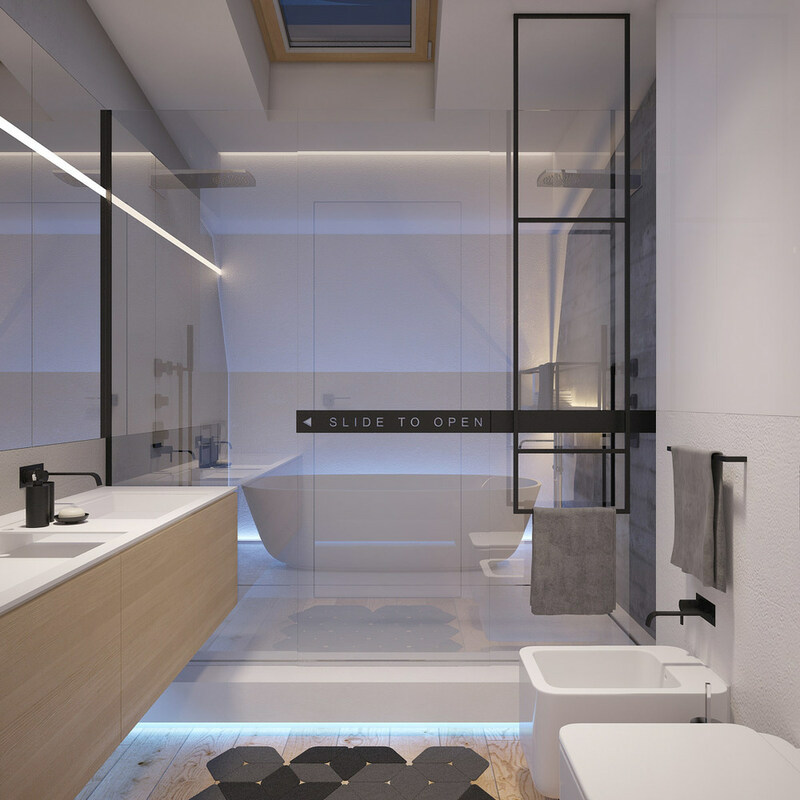 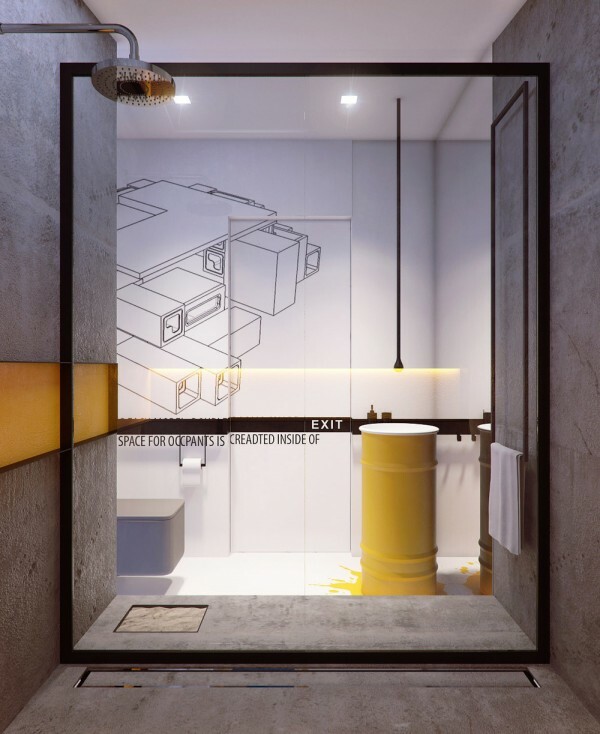 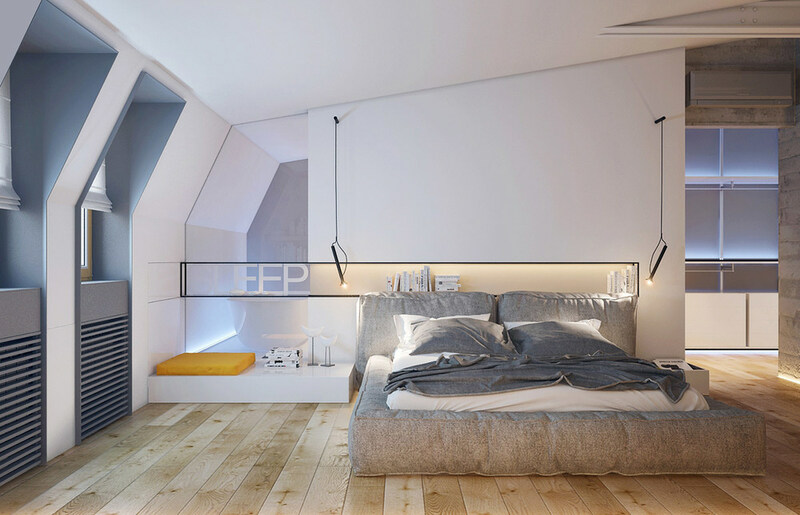 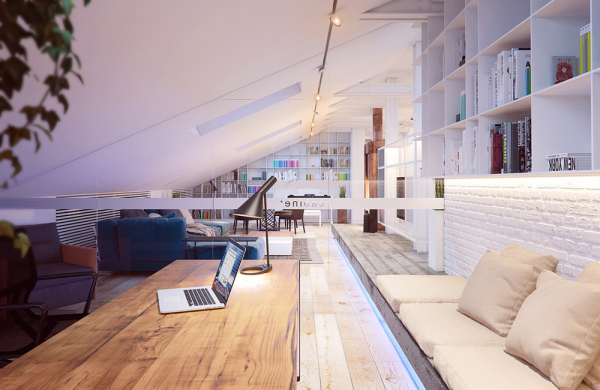 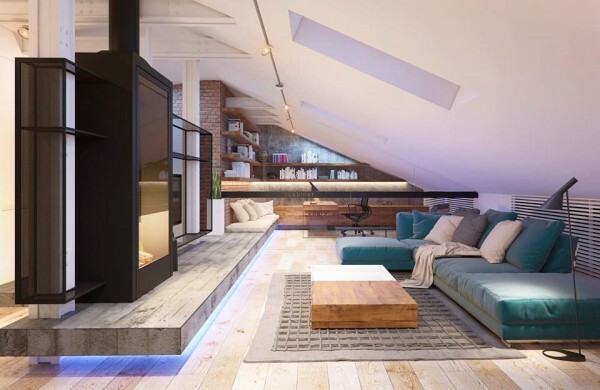 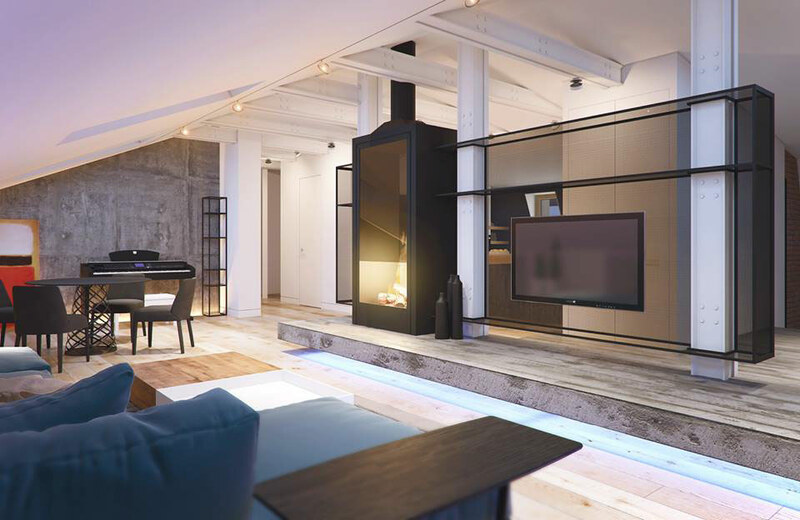 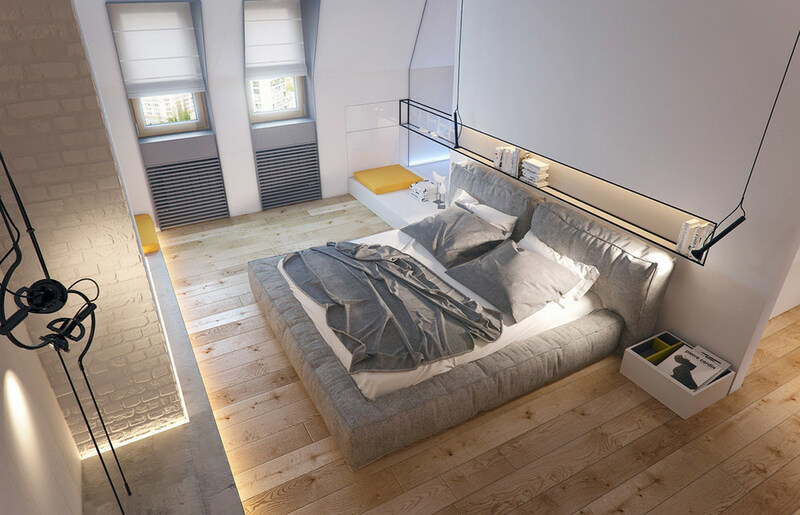 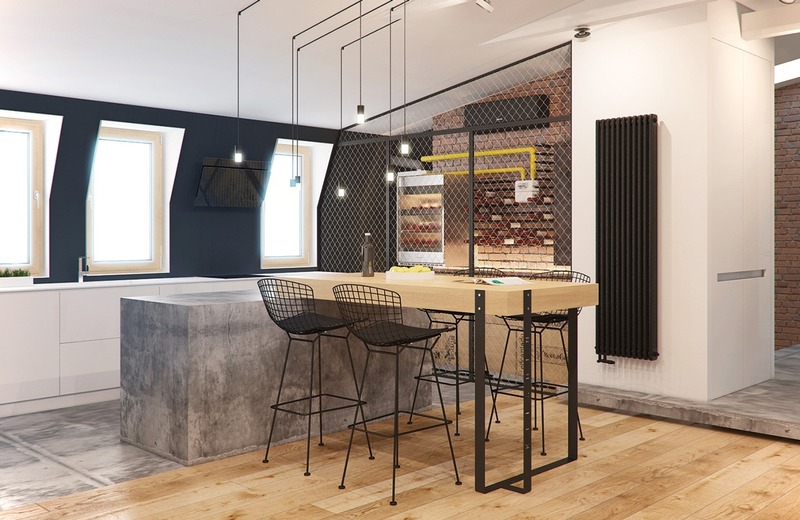 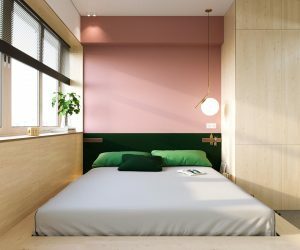 With 198 square meters (2131 square feet) available, plenty of design work went into creating this open and vibrant two bedroom loft in Kiev. 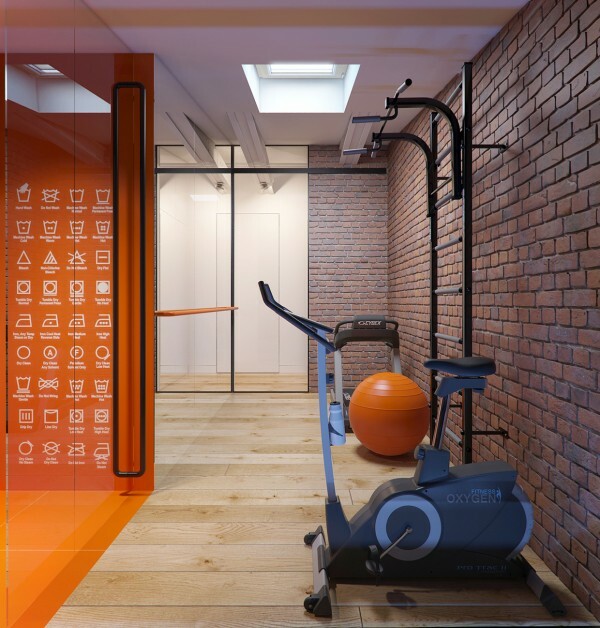 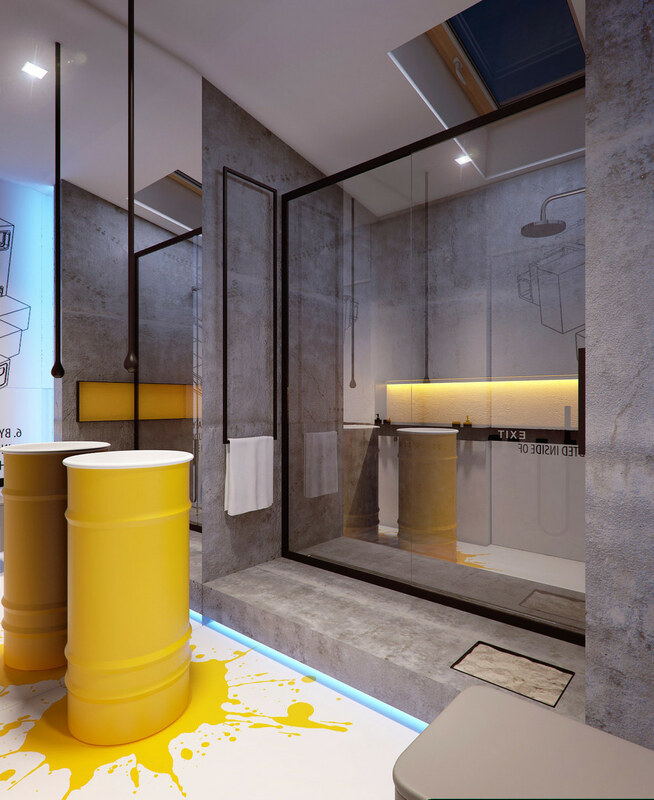 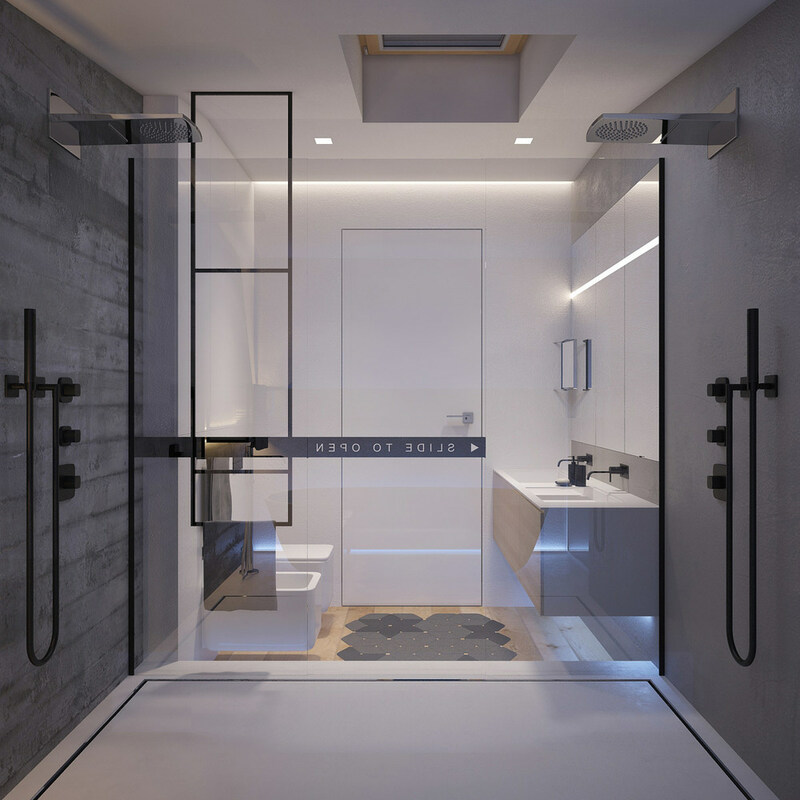 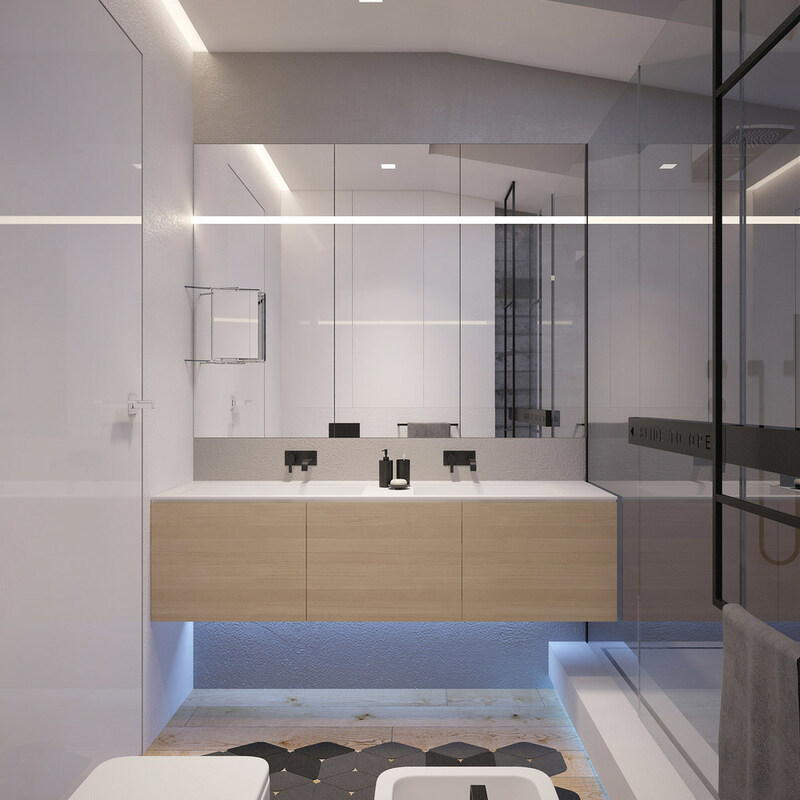 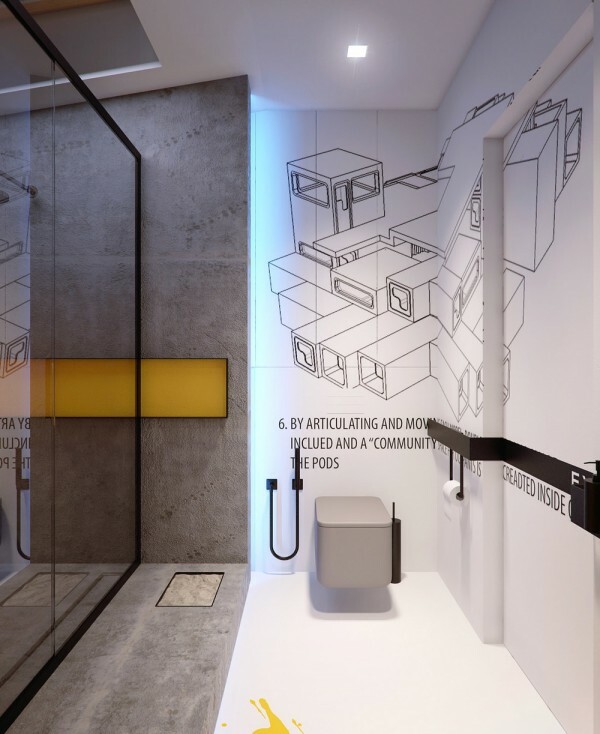 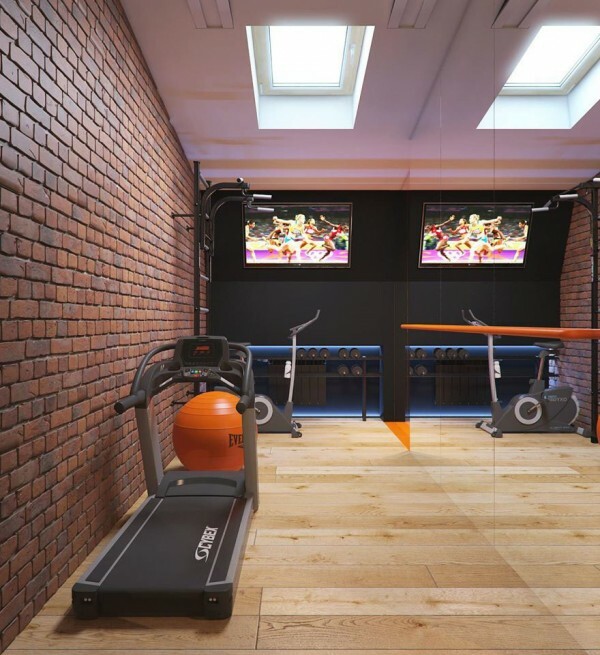 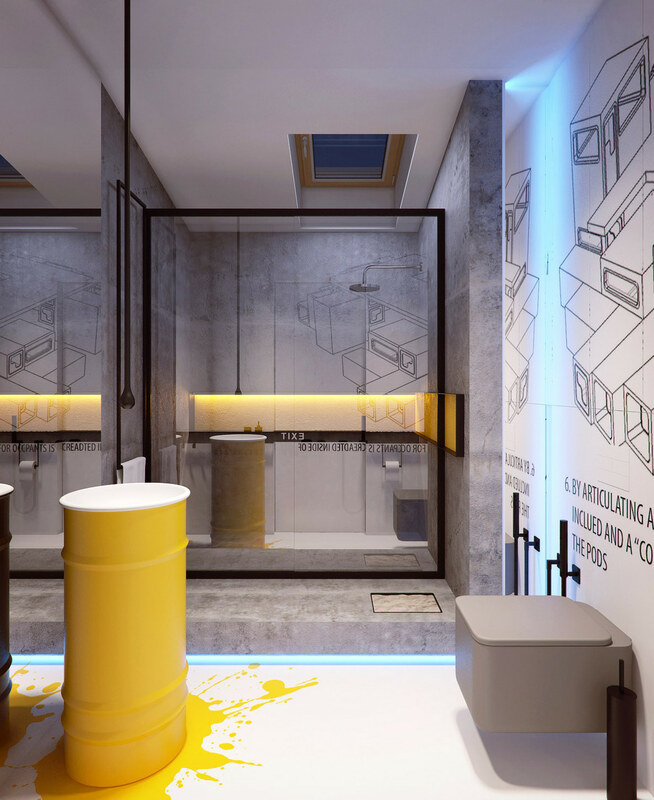 The space was designed by the architecture and design team at Ukrainian-based Soesthetic Group. 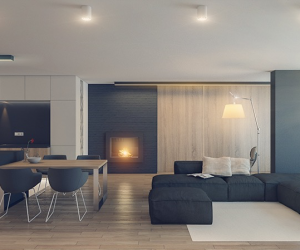 Although there are plenty of fashionable and even trendy elements in use - such as white painted brick and clean, contemporary lines - the overall feeling in the home is an overall timeless kind of style that is youthful and lasting. Take a look inside and see what we mean. 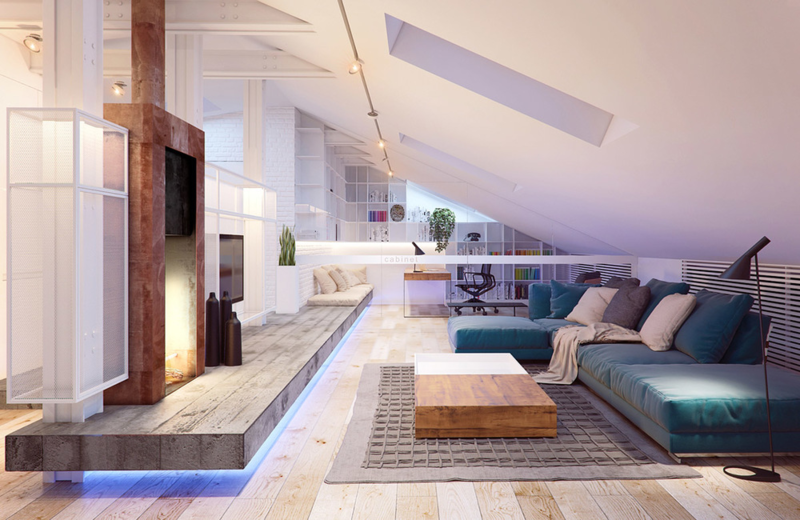 A top floor house, the pitched ceiling creates its own design challenges but also adds immediate interest to the main living area. By bisecting the large room with a floating wood platform, the design has managed to create separate spaces for work and relaxing without putting up any full walls. This makes the pitched ceiling more stylish and less closed off. 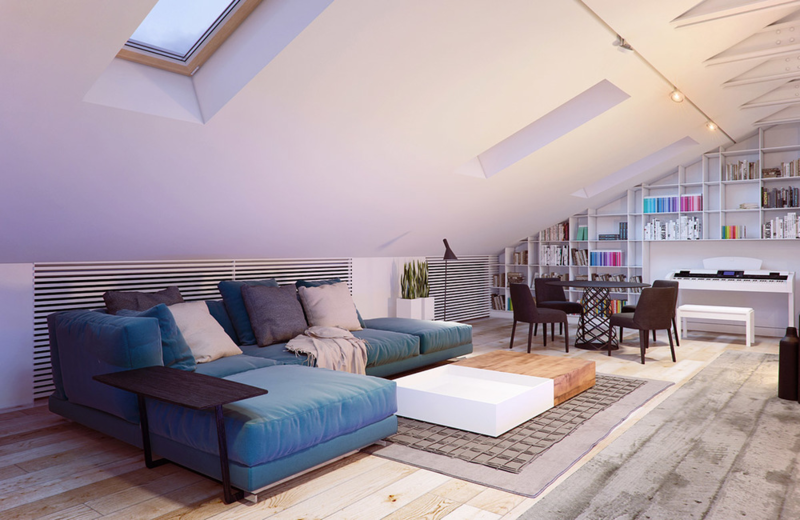 A couple of carefully places skylights and plenty of bright white paint help, too. 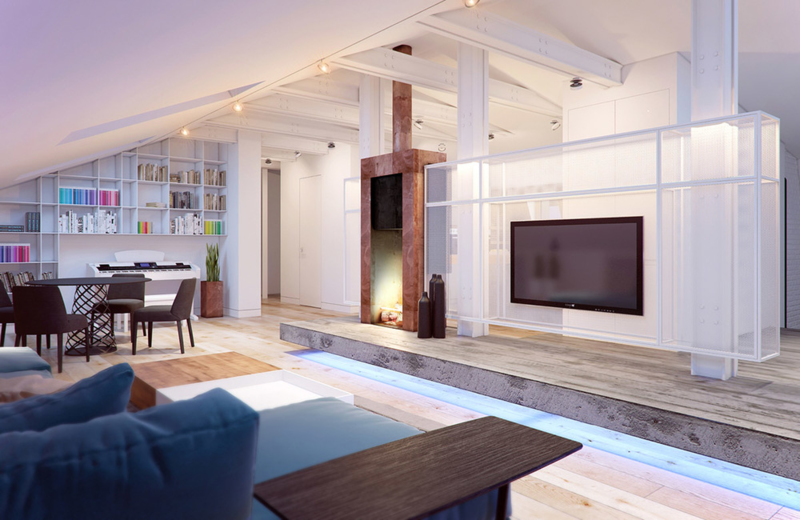 The television is hung from a custom mesh surface that separates the living room from the rest of the home but also lets light and air pass through. Next to that is a contemporary fireplace that is almost a modern spin on an old coal burning stove. 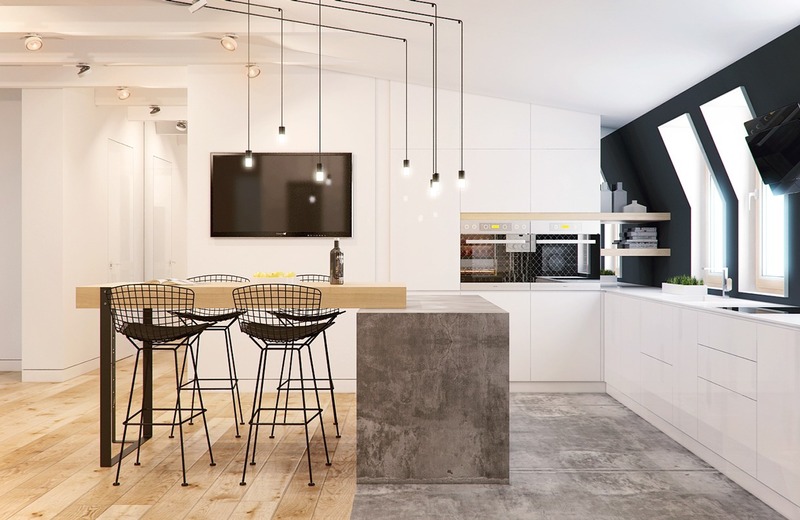 The kitchen is bright and a bit funky, with a concrete chopping block and sleek wire-backed bar chairs. 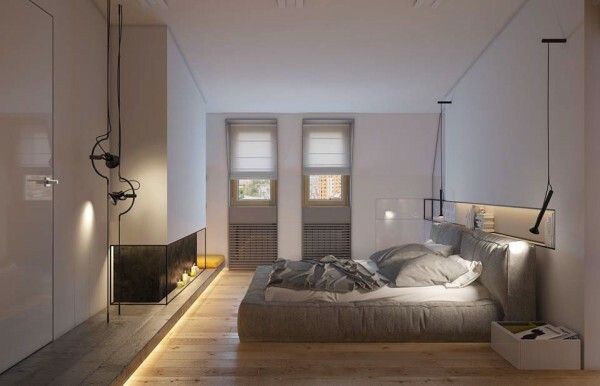 Small dangling lights have a bit of that Edison bulb aesthetic without taking it over the top into hipster territory. 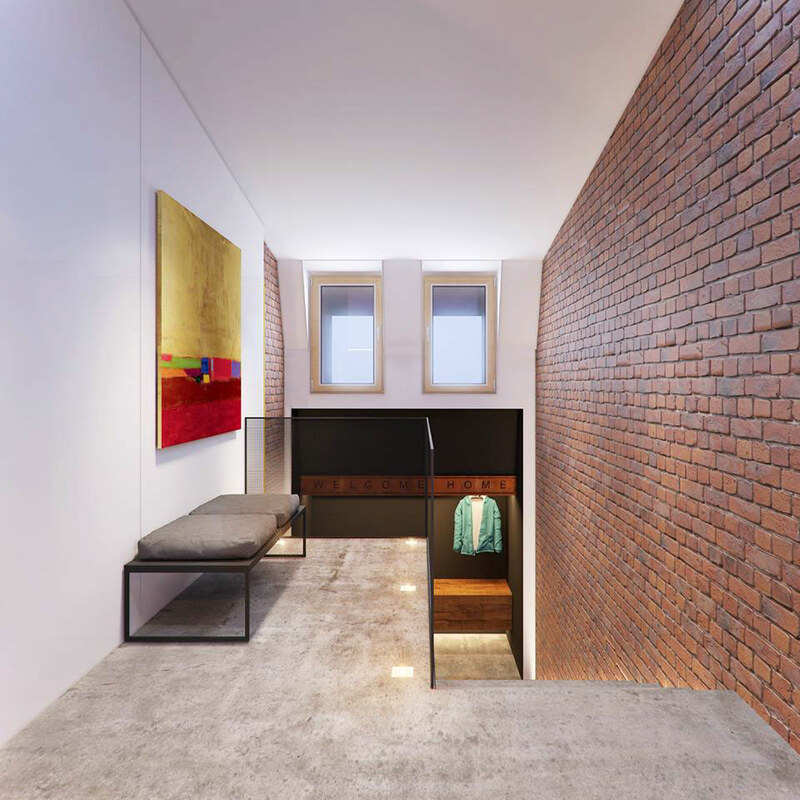 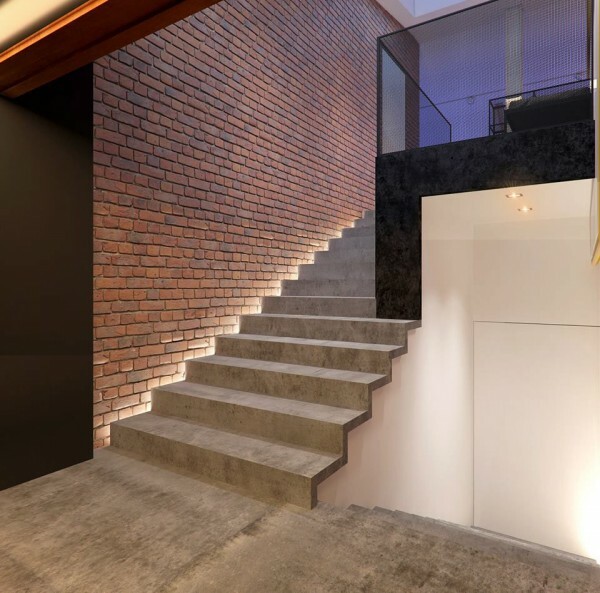 The home’s entryway is the perfect amount of minimal. Concrete flooring and stairs, coupled with a custom wood bench where people can easily put on and take off dirty boots and hang up heavy winter coats is a sight for sore eyes in the harsh Kiev winters. 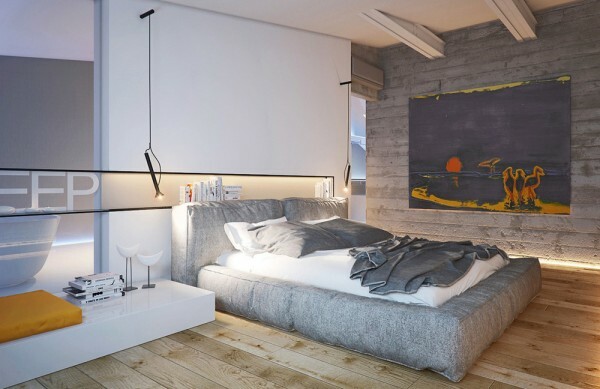 In the master suite we find things to be a bit softer with cozy grays dominating the color palette and deliciously soft fabrics on the bed. Some floating shelving makes for a bit of modernism while the ensuite bath is luxuriously simple. 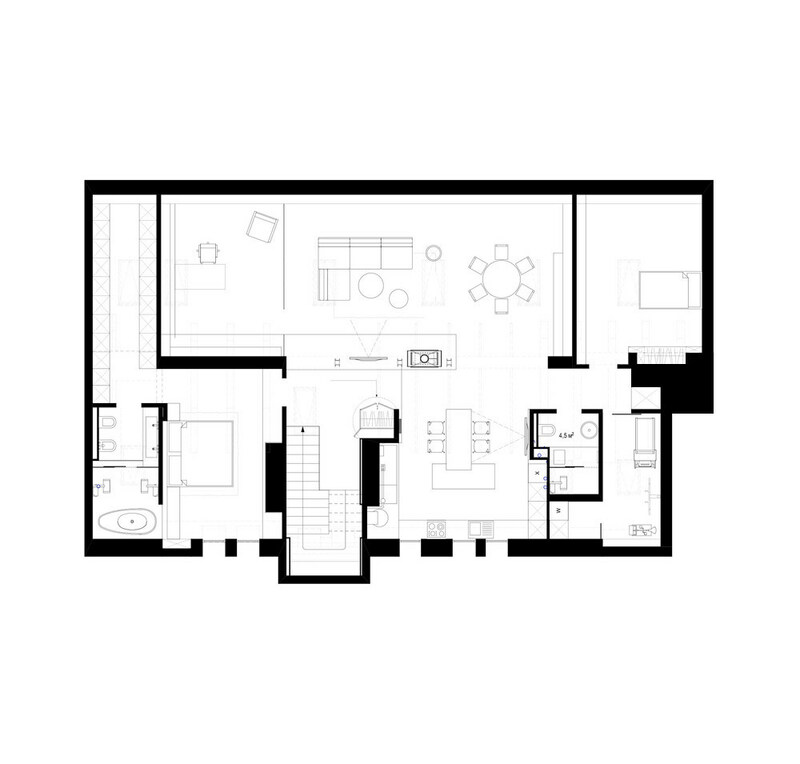 If you are looking for great floor plans for your dream home, may we recommend our ultimate pack of modern house plans? 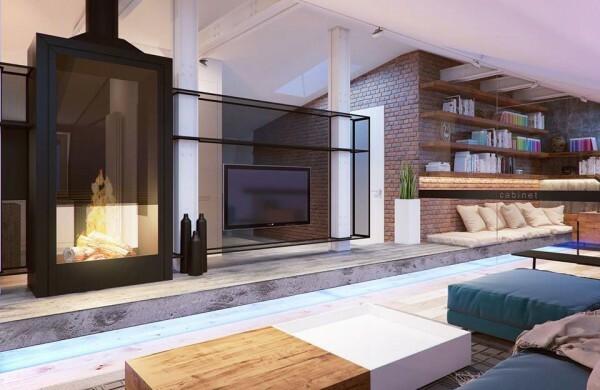 They were created by us in partnership with some of the leading architects from around the world and we offer them at a very affordable rate.